Amazon has decided to once again sell the Apple TV and Google Chromecast in its online store, reports CNET. An Amazon spokesperson confirmed that the company is officially offering the two products as of today. "I can confirm that we are assorting Apple TV and Chromecast," CNET was told. There are new product pages for the 32GB fourth-generation Apple TV, the 32GB Apple TV 4K, and the 64GB Apple TV 4K. There are also two listings for the Chromecast and the Chromecast Ultra. All of the products are listed as "Currently unavailable" right now, but that is likely to change soon after the listings are completed and propagated to Amazon's site. Amazon first stopped selling the Apple TV and the Google Chromecast in its online store in 2015, claiming the reason for the removal was incompatibility with the Amazon Prime Video streaming service. "Over the last three years, Prime Video has become an important part of Prime," Amazon said in the e-mail. "It's important that the streaming media players we sell interact well with Prime Video in order to avoid customer confusion." 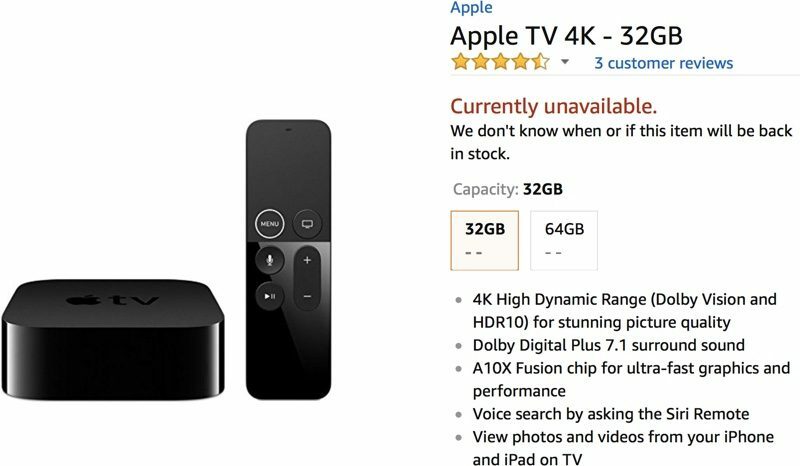 Since then, the Apple TV has been unavailable on Amazon's site, but Amazon's original reason for not selling the Apple TV was invalidated with the launch of the Amazon Prime Video app for Apple TV. Amazon last week introduced a long-awaited Amazon Prime Video app for the Apple TV. The new app is available on third, fourth, and fifth-generation devices. The return of the Chromecast to the Amazon site comes after Google once again removed YouTube from the Amazon Echo Show and the Fire TV. Google said Amazon's refusal to carry the Chromecast and Google Home and its refusal to make Prime Video available for Google Cast was a key reason that it stopped supporting YouTube on Amazon's products. Realized how stupid they looked supporting net neutrality in public yet was blocking the competition. the fact that its not available on the OG AppleTV is ridiculous. OG? That device is over a decade old. Will this be enough to reverse Google’s descision to pull YouTube from FireTV boxes I wonder? Funny how they’re playing chicken.. Amazon selling a lot of FireTV boxes around Xmas only to have YouTube disappear on 1st January and a bunch of people get angry is.. Funny but annoying. I'm sure it will. The ATV backdown is weird, but once they started supporting the ATV, they were pretty much obliged to sell the things, at which point singling out Google's ChromeCast both looks indefensibly anti-competive, and also makes it harder to sell the idea that this is all Google's fault. Not exactly surprising... despite all my other gadgets and Sky box, I still use my lil first gen Fire TV I got for my birthday once, it’s one of my all time favourite gadgets :) proves to me their is a place for these small streaming boxes despite what people say. Although I think Apple has overpriced the 4K model. I’m glad to see these two getting along now. Umm, they never were blocking the competition, if Prime Video was available on the device, they allowed it on Amazon. For example, Roku has always been on Amazon. There is nothing inconsistent with saying if they don't support our service, we won't sell their product and then after they do support their service, they start selling the product again. Apple and Google never refused to support Prime Video. Both have an open App Store. Amazon could have developed an app for Apple Tv and Chromecast years ago. They simply didn't want to. In 2015 Amazon suddently removed Chromecast and Apple tv from the store because they (Amazon) didn't make a Prime Video app. hmm. Maybe because they now have an app on those platforms. Amazon still doesn't support Prime streaming to the Chromecast. But they lost Youtube on the Echo Show and soon the Fire TV, so that forced them into adding the Chromecast back. It will be interesting to see if Google forces them to support Chromecast before they add Youtube back. I think that would require them to actually make a YouTube app available for the Fire. Since Fire is AOSP, it literally is as simple as allowing Amazon to add the apk to their App Store... that’s what Google’s beef really is. Amazon has their own “YouTube.com” app, which uses an old api and can block out ads, so Google is losing cash.